is an engineer, writer, and photographer in Japan. dispatches from japan: Jan 16, 2002 - Yokohama, Japan Happy New Year! We're back from Thailand and settled again. We also squeezed in a quick visit to Osaka. I haven't updated ROV in a year, so I thought I might take a second crack at it. Check in at the end of the month. If there's not anything new year here, at least you'll have an accurate measurement of my ambition level! Yep. 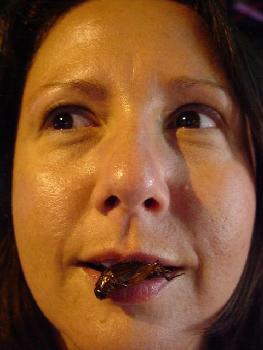 That's a big 'ole grasshopper in Angie's mouth. We bought this in a mixed bag (with crickets, bamboo worms, and silk grubs) in a market in Phitsanulok, Thailand. It tastes okay. Your basic wok-fried, crunchy beer food. The only difference is that it's healthier than popcorn!